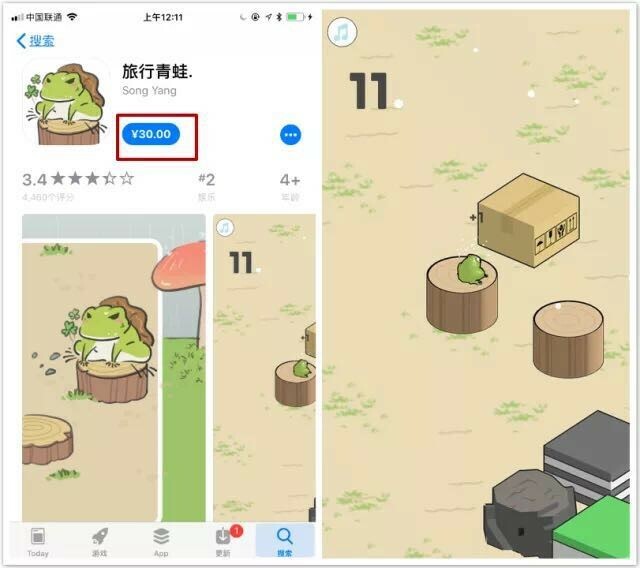 An app about a frog that likes to travel has exposed worrying signs that Apple isn’t doing enough to prevent fake apps from entering its App Store in China, the world’s largest smartphone market and Apple’s single largest country for app revenue. The story centers around ‘Tabi Kaeru’ — or ‘Travel Frog’ — a Japanese app that has become an unexpected viral hit in China. The game, which is only available in Japanese, stars a frog that requires feeding and care but periodically leaves on trips, returning with mementos of the places it has visited. The New York Times reported that the app struck a chord with Chinese consumers who were drawn in by the frog’s vicarious travel, eager to find a companion that fits in their pocket, or a combination of the two. Aside from shining a light on cultural trends in China, the rise of the app highlights alarming signs that Apple isn’t as strict at enforcing rules for its App Store in China as it is in other parts of the world. The iPhone-maker has a reputation among developers for its tough approach to vetting apps before they are allowed into the App Store — just yesterday it briefly pulled apps from popular messaging firm Telegram — but research from China-based social media marketing firm China Channel has shown that more than 30 apps imitating Tabi Kaeru were accepted into the Chinese App Store. In one case, the most successful knock-off — an app named “旅行青蛙.” — was able to generate significant revenue after seeming to game the App Store and gain a prominent position in its charts. The genuine version of Tabi Kaeru surged to the top of the Chinese App Store on February 21, which is when social media sites in the country became flooded with images, comments and hashtags related to the smash-hit. That awoke unscrupulous developers, who quickly coded up fake versions and submitted them to the App Store. 旅行青蛙. entered the App Store on January 22 as a paid download costing 30 RMB, or around $4.50. But beyond just surfing the wave of interest in the game, the developer behind the app also took out paid App Store ads against the hot keywords that had flooded social media in order to attract attention. The app also benefitted from another key incident, when the official game was delisted from those same keyword searches later in the day on January 22. It isn’t unclear whether the developer of the fake (旅行青蛙.) app was behind that, but the person or team certainly did benefit from the delisting. The official incarnation out of the picture on search, the fake app surged to reach the top of the paid-for download chart for all of China that day. It stayed there for 10 hours until it was removed by Apple when, presumably, the company noticed it charting high. The genuine app was later restored to the search positions it had been removed from before. Samin Sha, Chief Analyst at China Channel, told TechCrunch that the fake app is estimated to have clocked as many as 30,000 downloads during that brief time in the App Store, which he estimates at around 30 hours. That means it could have grossed as much as 900,000 RMB. After removing Apple’s 30 percent cut for app transactions, that would give the developer a payout of around 630,000 RMB, or approximately $100,000. Given that it was a paid version of a fake app, Sha said he expects that a portion of that figure was returned in refunds, but even still it remains a shockingly high number. In particularly, Sha believes the sequences were planned, and that the developer of the fake app knew how to get the genuine app delisted from search terms in order to maximize his app’s time in the store. “Most people have an impression that Apple is the king, that it rules everything and knows what is going on. But in this case we found that the situation is shifting. [The developer behind the fake app] seemed to know all the rules of the App Store, and where Apple is weak,” he explained. It gets worse, however. That particular fake app was just one a cluster of Tabi Kaeru’s knockoffs that made it past Apple’s vetting team and into the Chinese App Store. Sha and his team identified more than 30 copycats. Bizarrely, Apple removed a number of the fakes each day, but it continued it vet more knockoffs which were added to the App Store, according to App Store data collected by China Channel. More embarrassingly still, Sha said that there was no such swarm of fake apps on Android app stores, despite the huge number of third-party stores that exist in China because Google Play is banned. China Channel found no outbreak in app stores controlled by Huawei, Oppo, Tencent and others, Sha told TechCrunch. Sha provided more details on the incident in a LinkedIn blog post. There are wider implications around Apple’s failure to adequately vet the authenticity of these fake apps. Allowing dozens of fakes over a period of days highlights an apparent gap in the App Store vetting process in China. There has been speculation among developers and app marketers in China that Apple has outsourced its App Store vetting process to a local third-party, while other — including Sha — speculate that the company is simply handling the process out of the U.S., where its team has little to no knowledge or expose of trends and culture in China. Apple declined to comment when we asked for details about how it vets apps in China. The issue is a huge one that goes well beyond a traveling frog. China overtook the U.S. in October 2016 to become the largest market in the world for App Store revenue, according to data from analytics firm App Annie, and it continues to grow faster than any other place on the planet. A recent report from App Annie found that consumer spend across all app stores in China rose by 270 percent between 2015 and 2017. The U.S. ranked second with 75 percent growth. That sheer volume of revenue means it is of paramount importance for developers and anyone else owning original IP that imitations are not able to pass Apple’s checks to enter the App Store. “Apple doesn’t have a localization strategy in place so they don’t really keep track with what’s happening in the China App Store. Bad practices like this have become quite common,” China Channel‘s Sha added. If a viral frog can pull in $100,000 in just one day, any company or project can miss out on meaningful revenue if Apple doesn’t police its own ecosystem adequately. The added irony, of course, is that the company can be stringent in China when it is told to. Apple took the deeply unpopular step of removing VPN software from the App Store last year at the behest of the Chinese government. It later explained that it removed the VPNs, which allow users to bypass China’s internet censorship controls and use services that are blocked in the country, because they are illegal. Today, February 2, Apple removed the Tabi Kaeru clone apps from the App Store one day after TechCrunch first contacted the company to highlight the issue and seek comment. Apple confirmed to TechCrunch that it had removed the apps. It did not respond to questions about the processes it uses to vet apps in China, or whether it works with third-party entities to do so. Come up with your own ideas. We know you have them, so make yours come to life. Don’t simply copy the latest popular app on the App Store, or make some minor changes to another app’s name or UI and pass it off as your own. In addition to risking an intellectual property infringement claim, it makes the App Store harder to navigate and just isn’t fair to your fellow developers.